Well known as Thailand’s leading family friendly hotel chain, Centara Hotels & Resorts will leave you spoilt for choice when planning your next family getaway. 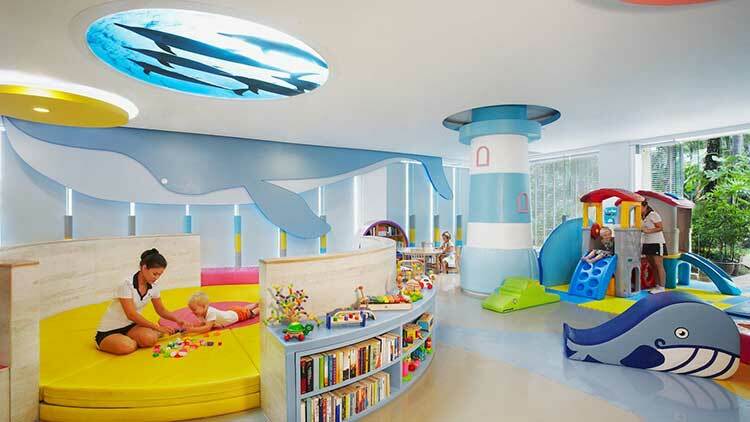 The kids' club inside the JW Marriott Phuket Resort & Spa. The pool and kids' area at Centara Karon Resort Phuket. 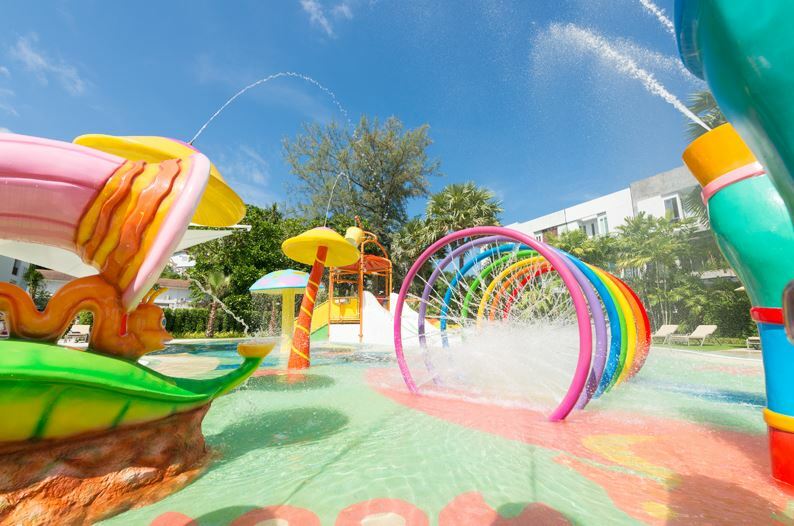 The children's water park at Katathani Phuket Beach Resort. There are many resorts in Asia that families love, for a number of reasons. Here are just a few you should consider taking the crew to. The pool and kids’ area at Centara Karon Resort Phuket. 1. Offering a range of deluxe 4- and 5-star accommodation in all main leisure destinations in Thailand – including Phuket, Krabi, Pattaya, Samui and Khao Lak, as well as properties in Maldives, Sri Lanka, Bali and Vietnam – Centara Hotels & Resorts make a family holiday affordable for everyone. 2. The best news for all holidaying families: kids stay and play for free in all Thailand properties! 3. 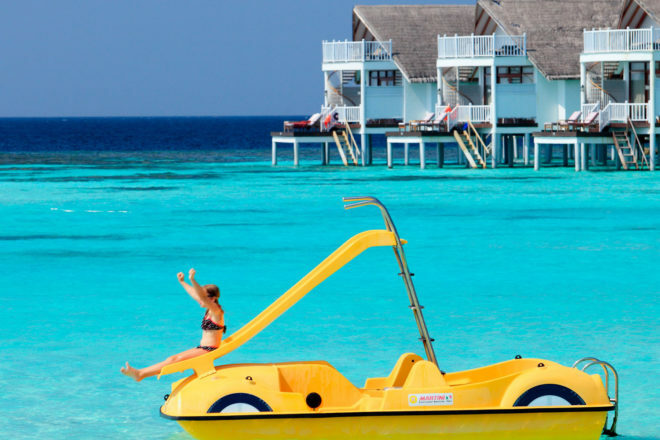 When holidaying at Centara Grand Island Resort & Spa Maldives, no planning is required at all as the resort’s “Ultimate All-Inclusive” programme includes free meals and drinks, island excursions and selected water sports. 4. Relax in the comfort of spacious top-quality rooms, suites and pool villas. Whether you decide to stay in a Family Deluxe Room with 2 double beds or a Two Bedroom Suite or Villa, Centara Hotels & Resorts offer configurations suitable for families of all sizes. 5. 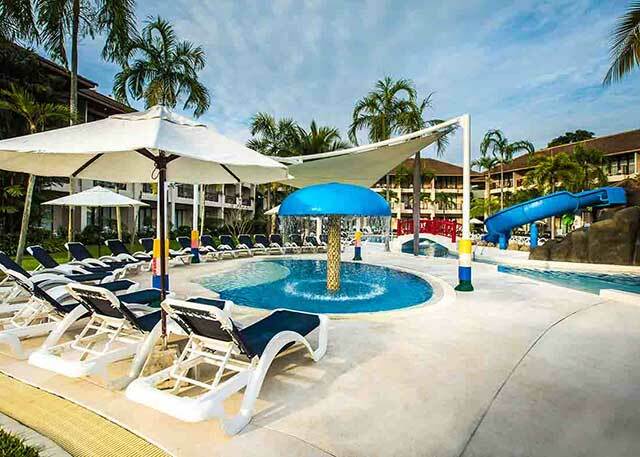 Centara Hotels & Resorts contains waterparks in Thailand to keep your kids busy – Centara Grand Mirage Beach Resort Pattaya. Lazy rivers, fun slides, waterfalls and jumps are sure to keep the kids amused! 6. All family resorts also offer a fun-packed programme to families, including kids’ yoga, mini discos, treasure hunts, beach soccer and more. Parents can enjoy some time off with the kids being looked after by the resorts’ Kids’ Clubs and e-zones. The kids’ club inside the JW Marriott Phuket Resort & Spa. 1. Close proximity to the airport means that families don’t have to travel too far to get to their hotel. A big plus for young, impatient tots! 2. There are three upscale swimming pools featured around the resort. 3. There’s also an amazing kids’ club (with trampoline, video games, and a pool table. 4. The hotel is considered child-friendly luxury, meaning that there are enough amenities to keep the kids occupied, and facilities to pamper tired parents. 5. There are kids’ rooms for both the smaller tots and the teenagers, with play equipment, books and puzzles galore in the child’s rooms, and pool tables and chic teenage hangouts for the bigger kids. 6. There is also a kids’ theatre with an underwater theme on site! The children’s water park at Katathani Phuket Beach Resort. 1. The hotel features 479 large rooms, perfect for families travelling to Thailand. 2. There are a whopping six pools on site, one with a child-friendly water park. 3. There are an incredible amount of kid’s activities, from classes in beading, cooking and Thai kite making. 4. There’s also an on site slide and ball pit for the younger kids. 5. There are also four shallow kiddy pools on site. 6. Older kids can take part in billiards, table tennis, and even have a go on the putting green.